Gareth Evans worked in, and with, botanic gardens for 16 years, specialising in the history of plants and medicine. 'Seeds of Inspiration' Linder Memorial Lecture, Beatrix Potter Society, London, March 2018. 'Keats's Flight from the Vegetable Monster'; Keats's anti-scientific stance in his 1817 poetical imagery. Paper at the 4th Bicentennial John Keats Conference: John Keats, 1817: Moments, Meetings, and the Making of a Poet, May 2017. ‘A Growing Correspondence’, a group presentation at Bartram 300, the John Bartram tercentennial conference at Philadelphia in 1999 supported by the Chelsea Physic Garden. Papers and features on Keats and botanical culture for the Keats-Shelley Review and The Lancet. The upgrading and refurbishment of the historical pharmacy installed at the National Botanic Garden of Wales. Curatorial work on the historical collection at the Welsh School of Pharmacy, Cardiff University. Membership of the curatorial committee, and leader of Plants and Medicine group, of the Cymru/Wales programme for the Smithsonian Institution’s Folklife Festival 2009, Washington DC. 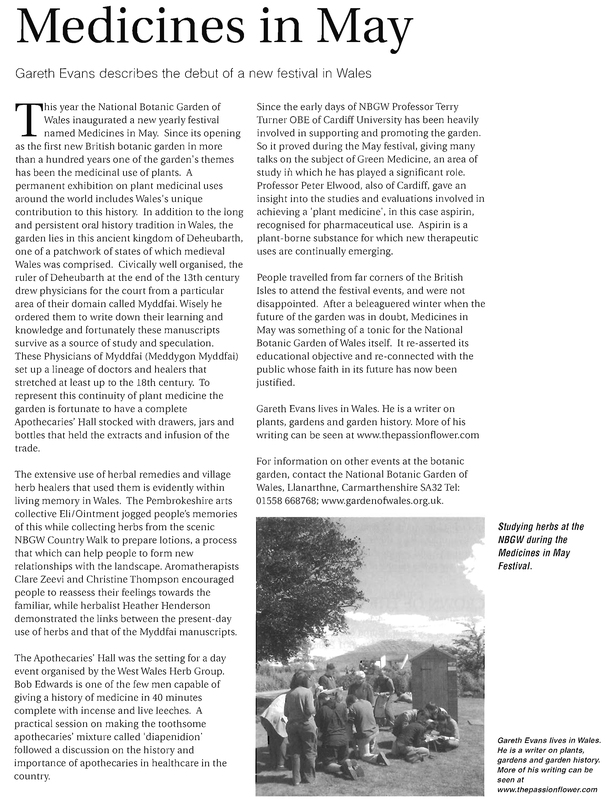 Also food columnist, Grassroots, the Royal Horticultural Society staff newsletter 2000-2002. Talks and presentations for variety of organisations including National Trust and U3A. Member of the Keats Foundation. All articles and documents copyright Gareth Evans. ‘Poison Flowers; John Keats and the Botanic Pharmacy’. Keats-Shelley Review No. 16 2002. ‘Nothing but Flowers’ John Keats. ﻿‘Poison Flowers; John Keats and the Botanic Pharmacy’. 'Herbs', the journal of the Herb Society, 41:4 December 2016. 'Bah Humbug', white horehound cough drops. 'Weeds and Wild Flowers - a Victorian cultural collage.' Herbs vol. 39 no. 4, 2014. 'Put in a large spider; a Caernarvon pharmacist's herbal notebook.' Herbs vol. 38 no. 4, 2013. 'The knowing of herbs; poet and scholar George Herbert', Herbs 38.3, Sept 2013. 'Meadowsweet - history in a pudding bowl.' Herbs 37.3 2012. ‘Sacks & the City’ Nuremberg. Herbs 36:4 2011. 'The knowing of herbs; poet and scholar George Herbert', Herbs 38.3, 2013. 'The Importance of being Wormwood', Welsh herbs. ‘The Importance of being Wormwood’ Herbs 36:4 2011. ‘Health & Fortune; Chinese folk medicine & Robert Fortune’. Herbs 33:2 2008. ‘West Side Story; ethnobotany in British Columbia’. Herbs 32:2 2007. ‘Reading Classics’; John Sibthorp & Greece. Herbs 31:2 2006. ‘Medicines in May’; inaugural NBGW medicinal festival. Herbs 30:3 2005. ‘The Time Machine; the Apothecary’s Hall at NBGW’. Herbs 29:3 2004. ‘Läckö Slott; at the round earth’s imagin’d corner’. Herbs 28:4 2003. ‘Faded Glory in Spain’ An herboristeria in Barcelona. Herbs 28:1 2003. ‘Linneaus in the Fields’. Herbs 25:4 2000. ‘John Bartram of Philadelphia’. Herbs 24:3 1999. ‘John Keats, Poet & Herbalist’. Herbs 23:2 1998.